Vera Wald photographed this beautiful Jadera nymph in Rio Grande do Sul, the southernmost state in Brazil. Despite the astonishing detail of this image, it is still difficult to discern exactly what species this is. 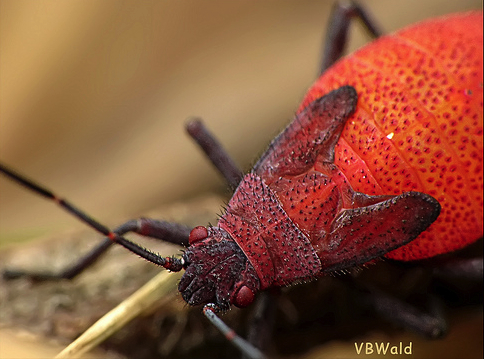 The physical traits that a soapberry bug exhibits in its adult state can be critical to its identification; but this well-fed nymph is not quite at that state yet. Based on its locale, it is likely a Jadera coturnix or Jadera choprai. Note that Vera used a straightforward point-and-shoot camera to take this phenomenal image. This serves as a pleasant reminder that expensive photographic gear is not always needed to take wonderful insect photos! Please see the link below for more of Vera's great insect photography.